Fun fact about me: I actually really enjoy historical fiction... sometimes. I have to be in the right mood for it, which is why it kind of took me awhile to get around to this one even though I was immediately drawn in by the description! My focus in college was Roman history, so I didn't get to learn a whole lot about Alexander the Great, but I was definitely excited to read his story (with a dash of magic, of course)! Legacy of Kings is a book that tries really, really hard to do a whole heck of a lot. This isn't just one story. It's several stories told in seven points of view. Yes, you read that right. Seven. Which is kind of a lot so I'll try really hard to make some sense of it all here, but I'm warning you. This was a hard review to write. Arguably the leading lady in this sprawling tale is Katerina. Her story (along with Jacob's) begins rather abruptly and I was immediately a little confused about these characters and why I should care about them. Kat and Jacob are essentially childhood sweethearts and Jacob's main mission in life is to prove that he's worthy of her. Eventually more is revealed about their backstories, but be warned! This book literally throws you head first into the action. From the get go, we find out that Jacob has been entered into a tournament where he has a very good chance of dying. Katerina tags along for her own reasons, which really don't make much sense to begin with either. Prince Alexander (the Great) and Hephaestion are besties living in the palace who have a secret mission of their own. Unfortunately, Alex's sister, Cyn, is trying to make their lives difficult to fulfill her secret mission. Meanwhile, Alex's mother is working on her own (creepy) secret mission. In a land far, far away, Zofia is on her own secret mission (shockingly) to ensure she gets to stay with her one true love instead of being forced to marry Alexander. As you can see, this story was quite a lot to take in. The characters were all pretty enjoyable, honestly. The problem that I had was not having adequate time to really get to know any of them. Zofia's story was definitely the one out of the seven that really didn't seem to have a place. I found myself confused for a moment each time her story came back to the spotlight. I actually forgot who she was once or twice! That isn't to say her story wasn't interesting, because it was. There just wasn't room in this book for everything it tried to accomplish. I most enjoyed Hephaestion's story. He was a complex character who had an interesting backstory and felt the most genuine out of all of them. I think that out of the seven characters, Heph was the one who felt the most emotion (I'm interested in why his anger management issues seemed so important) and seemed the most real. Despite the fact that Kat was supposed to be a peasant girl, she was hard to identify with, being pretty darned good at everything she set out to do. Speaking of Kat, there is a definite love triangle (almost a love square at times) in this book, so if you're not into that you may want to avoid it. The triangle is subtle, but it's definitely brewing. But maybe you're wondering about the magical aspects of Legacy of Kings! After all, that's what should set this apart from any other historical romance, right? Well, it's certainly interesting. There are a few different types of magic in this book and they're all really intriguing, although I wish they had been better explained. I'm definitely expecting the details of the magic to be explained in more detail in the next book in the series. While Legacy of Kings was an interesting read, I definitely feel like it had too much going on. I was intrigued by each of the seven stories, but never felt truly invested in any of them. In fact, the only books I've read with this many storylines have been at least double the size of this one! I'm hopeful that each one will be delved into deeper, but I do wish this book had been just a little less broad. 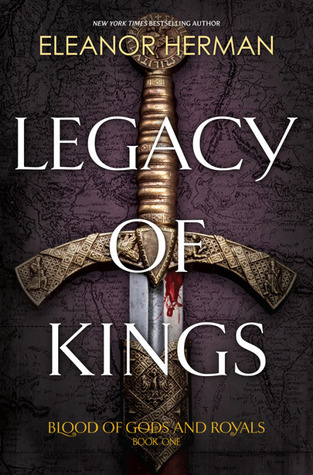 I would recommend Legacy of Kings to fans of historical fiction and stories told multiple points of view.